Oakridge is Oregon’s single-track sanctuary. Oakridge is a charming little timber-turned-mountain-bike town nestled in the majestic hills of the Willamette National Forest. Photo by Daniel Sharp. A close friend once said, “If at the end of the day your head’s been underwater, you know it’s been a good day.” Out of context, his wisdom sounds a bit odd, but consider this: A dip in a cold creek or a sunny lake means you’ve likely spent hours playing in the sunshine, and a quick plunge is just the icing on the cake. In Oakridge, a mountain biker’s playground 40 miles southeast of Eugene and 150 miles south of Portland, there’s plenty of cake and icing. Oakridge, a charming little timber-turned-mountain-bike town nestled in the majestic hills of the Willamette National Forest, has quickly made a name for itself as Oregon’s single-track sanctuary. Hundreds of miles of well-manicured trails, from steep and rocky to fast and flowy, have earned Oakridge recognition from Bicycling, Outside, Dirt Rag and a host of other outdoor magazines. 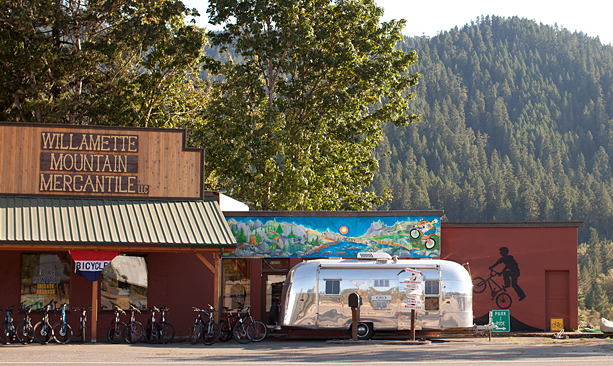 And for good reason: The tiny town of just more than 3,000 people has, in recent years, further capitalized on its mountain bike glory and now offers all the perfect pre- and postride amenities; there’s everything from a decadent bakery and an English-style brewpub to a cozy place to rest those trail-weary bones. And in the warm weather, Oakridge boasts more swimming holes than you can shake a mini pump at. Mini pump! I was in town for a weekend’s worth of rides with a biking buddy and had forgotten mine. Nothing a quick visit to Willamette Mountain Mercantile couldn’t fix. The friendly employees set me up with a new pump as well as an Oakridge trail map (indispensable) and sent me on my merry way. Aside from riding gear, the bike and outdoor shop also keeps a steady stream of rentals going out the door, and they’ll happily point out the best trails given your goals. Ours was to ride some new-to-us single-track. The Larison Creek Trail, which follows a narrow gorge a few miles south of town, proved a perfect sunny Saturday afternoon loop. On the descent — which followed a scenic, well-signed climb — we were first rewarded with tight, steep switchbacks that soon gave way to fast, side-hill single-track on a rooty and rocky river trail. It was, in a word, inspiring. After a quick dip in the nearby Hills Creek Reservoir, we checked into the country-elegant base camp that is the Double Diamond Lodge Bed & Breakfast, my weekend accommodations. Fastidiously built over the course of more than a decade by its owner, Norm Coyer — a lean, smiling mountain bike fiend and accomplished contractor who’s lived in Oakridge since 1984 — the gorgeous, two-story bed and breakfast sturdily stands on local timber and reclaimed lumber, and it was filled with sunshine thanks to its floor-to-ceiling windows. Norm and his wife, Erika, proved ideal trail consultants, and together we pored over my map and plotted Sunday’s ride. Norm is a longtime member of the Greater Oakridge Area Trail Stewards (GOATS), the hard-working enthusiasts who keep Oakridge’s world-class trails in top shape. So I listened when he told me Heckletooth Mountain is a burly mountain ride not to be missed. Norm noted, though, with a wink and a nod, that if we had one too many pints at the local brewery the night before, we might want to try something more mellow, like an out-and-back on the popular Middle Fork of the Willamette Trail. The North Fork Trail, another river trail ride, would also make for a fine day, he said. Sitting outside sipping a Black Wooly Jumper dry Irish stout at Brewers Union Local 180, our chosen dinner spot, it was easy to see what Norm meant. We found that the real-ale pub in the heart of Oakridge not only makes some of the most delicious beers in the area but some of the best food, too. The thoughtful menu — complete with mountainous salads and fresh veggie options, as well as hand-formed half-pound burgers (order with sweet potato fries) — pairs well with the house-brewed beers. Sitting outside watching the sun set over the distant hills with a frosty pint in hand is a brilliant way to cap off the day. Not wanting to hamstring ourselves (or disappoint Norm), we knocked off early. And good thing, too: Sunday’s loop was a jaw-dropper. Not an hour after consuming gallons of coffee and heaps of Erika’s carefully prepared, fresh egg frittata and fruit breakfast, we were grunting our way up a two-hour climb to the top of Heckletooth Mountain. The extended, banked downhill made the punishing climb well worth the effort (the sweeping vistas and cool breeze on Heckletooth’s summit helped too). Famished after our ride, we burst through the doors of the Lion Mountain Bakery, Oakridge’s No. 1 spot for rich brownies, oatmeal cookies and iced coffee. Sandwiches are also a sure bet here as they’re served on made-from-scratch bread (choose from sourdough, whole wheat, ciabatta or six other varieties). Tired but well fed, it was time to load up the bikes and head to Greenwaters Park for one last swim — just the way to cap off two days of mountain life perfection. Editor’s note: At the time of this writing, The Double Diamond Lodge owners, busy with brand new twins, won’t be accepting reservations until summer. For other lodging options, check out the Oakridge Lodge & Guest House or The Oakridge Motel. I moved to Eugene, Oregon in 1989 to join a cooperative. Burley Design Cooperative made bicycle trailers for children and cargo, as well as rainwear and tandem bicycles. Most U.S. shops carried us. At one point our west Eugene factory supported over 90 families. That was my second foray into the bicycle industry. I was a fresh MBA. My wife and I had just finished two years serving in the Peace Corps overseas. My job at the co-op was to ship ocean containers filled with Burley trailers internationally. That was a wonderful 10-year career. Before that, I managed bike shops in California. Bicycle Retail; that was my first foray into the bike trade. I did repairs, sold bikes, offered opinions and did the bank deposits. I loved it. Those were the days of Schwinn Continentals, Peugeot UO8’s and Huffy’s. With my third bike industry foray, I have created Mountain Crossing MTB a mountain bike services business. I provide services to people who are new to mountain biking – or want to step up their game. I teach operational skills, body/bike interaction and movement. The State of Oregon and the Willamette National Forest have granted me licenses to guide on trails. I also coach and focus on helping athletes develop a strategy for the racing seasons. After having raced MTB XC, cyclocross, road, and time trials since my 20’s, I’ve done tons of training strategy and race preparation. I’m looking forward to sharing what I know about this wonderful outdoor sport.